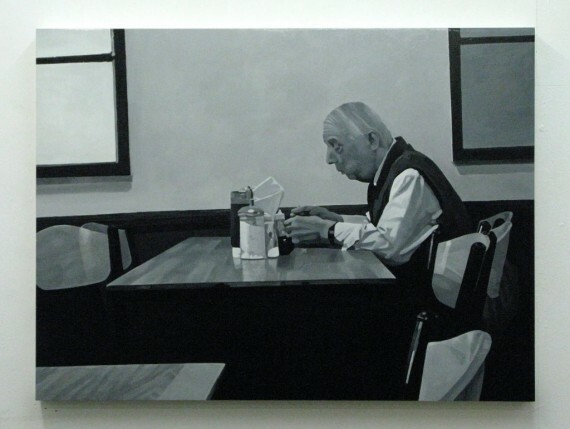 Nathan Eastwood has been awarded the £10,000 East London Painting Prize for his work Nico’s Café. Newham-based painter Nathan Eastwood has been awarded the inaugural East London Painting Prize for his work Nico’s Café. He receives a £10,000 prize plus a solo show at the Nunnery Gallery in east London later this year. The East London Painting Prize was created by The Legacy List, the charity of the Queen Elizabeth Olympic Park, with the Goldhill Family, Zabludowicz Collection, and in association with Bow Arts. It honours the life and work of east London property developer, arts philanthropist and amateur painter Jack Goldhill, and aims to support both established and emerging artists in the area. Eastwood was selected from a shortlist of 43 artists by a panel comprising Sarah Elson (Contemporary Art Society and Bow Arts Board), Matt Price (art critic and curator), Varda Caivano (artist), Michael Goldhill (representative of the Goldhill Family) and Maitreyi Maheshwari (acting director of Zabludowicz Collection). Nathan Eastwood’s solo show as winner of the East London Painting Prize will take place at the Nunnery Gallery in October 2014.